Hilda Coulsey reports ... Stunning performances by so many Harriers today. Congratulations to Tom Adams who won in a new record time of 38:44. Ilkley Harriers took both men's and ladies' team prizes with Tom Adams, Ruardith Mon-Williams, Ben Shepherd and Jack Cummings for the men and Rachel Carter, Jann Smith and Lucy Williamson for the ladies. Ruardith was 1st U23, Nick Pearce was 1st V60. Rachel Carter took 1st V40, Jann Smith 1st V45, Adela Reperecki 1st V55 and Hilda Coulsey 1st V60. Lots of Harriers took part in this League counter, a special mention for Ruth Jones in her first race. The weather was not too hot, it was dry underfoot. A great race again and a good social occasion. Thank you to Lawrence and all the helpers. Photos on the Woodentops website. From Dan Wilkinson ... A great evening race up Yorkshire's own Matterhorn, Roseberry Topping, quite popular this year with a field of over 150. I found some surprising good form and managed 2nd place. From Geoffrey Howard...The European Masters' Road (officially "Non Stadia") Championships are usually hosted each year by different countries. Vila Real de Santo Antonio in Portugal must have done a good job in 2005 because it was given the job again this year (or maybe its just that it's a very pleasant place for all concerned - officials, competitors and supporters). The runners who enter these events (no selection is involved and the field included an 85+ German guy) tend to be those who fancy their chances of a medal and those who see it as a part of a longer holiday in the competition area. My only previous participation was in fact in 2005, and I knew that Santo Antonio would fit in well with a walking holiday the previous week along Portugal's Alentajo coast during its peak wildflower period. I entered the flat two lap10k race which was held at 7.20 on the evening of 20 May when the day should supposedly have cooled to about 20C. In reality it was still 25C. Everyone seemed anxious to get on with it and, to me, the first lap was fast and furious so I found myself going stride for stride with a couple of v60s completing 5k in about 20m 30s but feeling like a steaming pressure cooker and wondering if another lap at that pace was possible. Unfortunately, however, this question turned out to entirely hypothetical as, just re-passing the start my hamstring went and I had to drop out. A disappointing outcome regarding the race but still it was exhilarating while it lasted and great to be a part of what in reality is a festival of running. I would normally recommend to anyone thinking of having a go in this type of event to do so and I have never (in about a dozen events) had any problems re entry, accommodation, transfers etc. until this year when going through the officially designated travel company for the World Masters' Mountain Running Championships in Susa, Italy. If any Harrier is thinking of going to Susa and using this company I would be happy to explain the difficulties I have had with the company. From Petra Bijsterveld ... The ever popular John Carr 5k race series in Esholt was run on a new course this year. Efficiently organized by Saltaire Striders and held on closed roads within the Yorkshire Water estate, the race (which has previously been a net downhill course) is now an out and back course, starting and finishing in the same place at Apperley Bridge. Still fairly flat with only 84 ft of elevation to contend with, but without the fast downhill finish of previous years. Chip timing had been introduced for the first time this year. The only downsides to the venue are the unmistakable odour of the water treatment works and the plentiful midges. 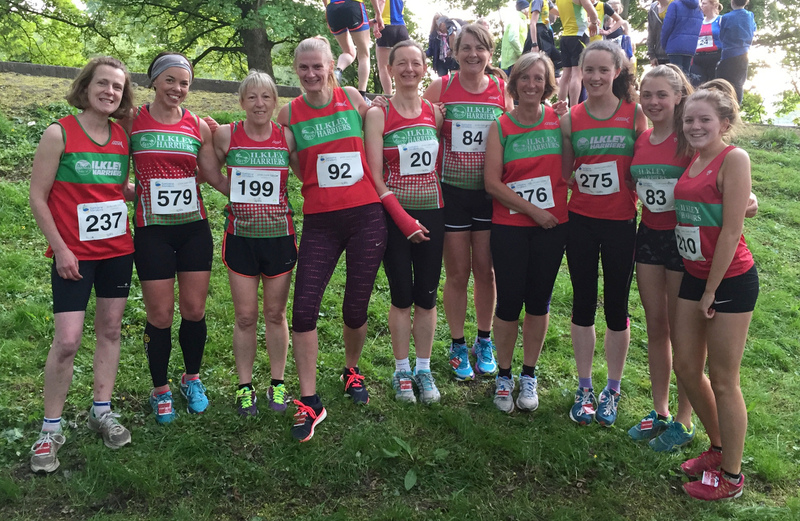 Ilkley Harriers were present in large numbers, especially for the first race which was a club league counter. Tom Adams won race 1 in 15:06, thereby making the record for the new course a tough one to beat straightaway. He also equalled our 5K club record which has been set in 1990 by Jack Brown on the track. Cameron Reilly came first in his category (Junior M11) at each of the 3 races. Bethan Morley and Lucy Haines came first in their respective categories (Junior F11 and F16) in races 1 and 3, both missed race 2 and could therefore not compete for the series wins. Geoff Howard, last year's V70 trophy winner, won his category in race 1 but missed races 2 and 3. Perhaps Geoff is running out of space in his trophy cabinet by now anyway! Taking part in all 3 races means, apart from collecting a nice bottle of ale, a chance of winning a series trophy, and we saw some excellent Ilkley performances here. Cameron Reilly and Oscar Stapleton were 1st and 2nd in their category (Junior M11) and Ella Shouler-Harris 3rd (Junior F11). For the seniors, Lucy Williamson was 3rd FSEN, Mark Iley 3rd M50, and Adela Reperecki 2nd F55. Trophies aside there was a lot of dedicated, eyeballs-out, lactate-zone racing from all, resulting in several new 5K PB's, amongst others for Helen Waddington and Steve Murray. On the lighter side, Tom Worboys still ran a good time in race 1 despite setting off several minutes late, unable to find the relocated start (hurrah for chip timing at least). Peter Lewis and myself ran with matching right arms in plaster, which I am certainly using as my excuse for being a little slower than I would have liked. The Saltaire Amarillo Gold Ale will surely taste good regardless. Thanks must also go to several Harriers who came along to offer support and cheer from the roadside which is much valued. Tom Adams and Jack Wood were representing Yorkshire at the Inter-county FRA championship race at Moel Eilio 12.8km, 915m on Saturday 14th May. Yorkshire claimed 1st position with Tom Adams 5th overall in 62:15 and Jack Wood 22nd in 65:45. David Green reports ... My first attempt at this hilly off road 10k. The race starts near Hawksworth Primary School and is well organised and marshalled. The course is hilly but thankfully and perhaps unusually was dry underfoot, taking in picturesque land south of Hawksworth village, before turning back again for a long climb back up the hill, past the start line and continuing up the Odda. From there the course runs to the rear of High Royds, crossing Mire Beck before another climb past Tranmere Park, back up the Odda before a final fast descent through woodlands and finishing in Hawksworth School. 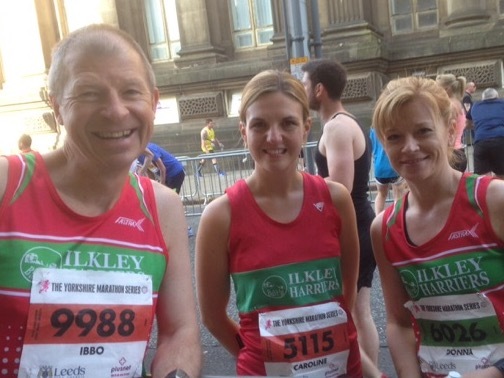 First Harrier home was Robin Nicholson in 44.37 with Lucy Williamson third female in 50.42. 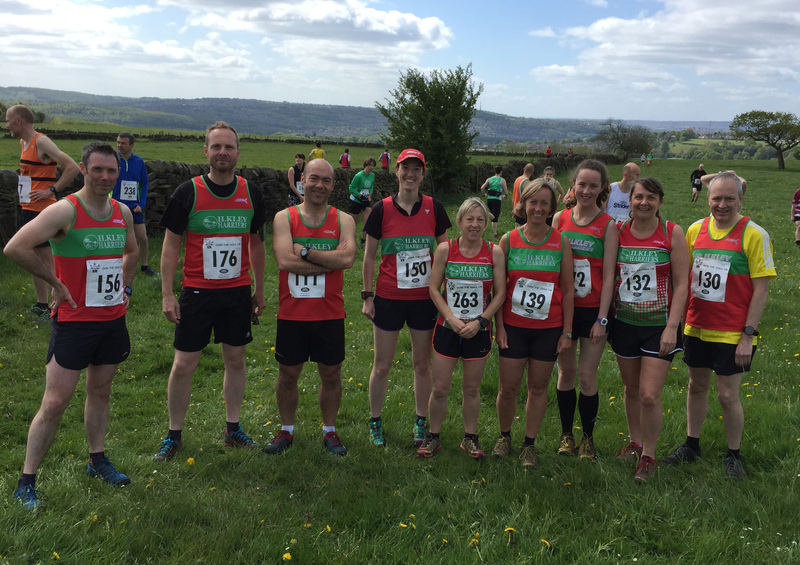 From Hilda Coulsey ... What a super Saturday morning; the weather was good and the trail was dry for this friendly, local, approx 10k run over the fields from Hawksworth with plenty of challenge. Robin Nicholson was first Harrier home, Lucy Williamson 3rd Lady and Adela Reperecki 1st F55 (beating 1st F50 and F35 times!). I was savagely beaten to the post by Paul Sugden who had been reeling me in for the last mile and if I'd known I'd have had a go at reeling in the lady ahead of us, beating me to 1st F60 by 8secs - aargh! Ho ho what fun. Tom Adams and Jack Wood have been selected to run for Yorkshire in the Fell Inter Counties at Moel Eilio, North Wales on 14th May. This was also the Yorkshire Junior Championships, with many good Ilkley results. 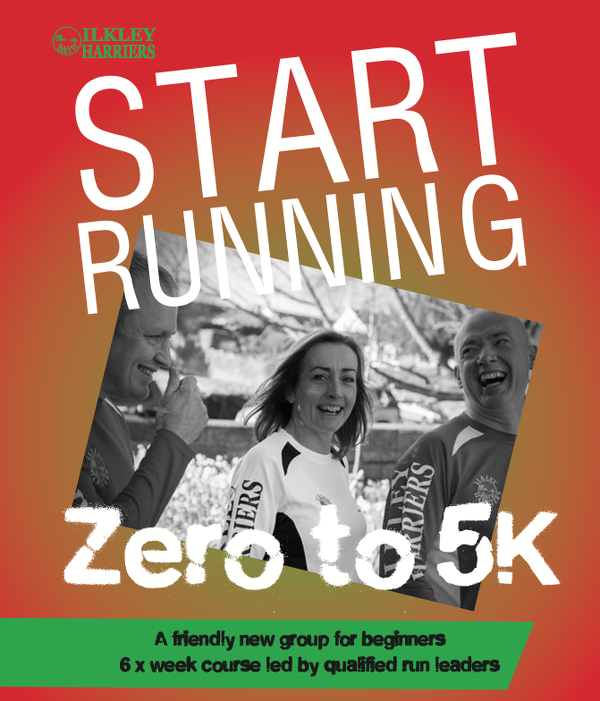 Starting Tuesday 3rd May 2016, Ilkley Harriers are starting a six week beginners' running course. The aim of the course is to introduce others to the joys of running and show that everyone can run and enjoy it! More info and application form. A great start, with over 70 new runners taking part, welcome!